Sam Shepherd a.k.a Floating Points has announced his return to The Tuesday Club on Tuesday April 17th, playing a rare all night long set. This announcement comes along with 3 more shows, including jump-up and drum ‘n’ bass don Macky Gee on April 24th and an Outlook Launch Party on April 8th. Floating Points returns to TTC for the first time since his 2013 debut at Fez Club. Since then he has established himself as one of the finest selectors on the circuit, known for his true eclecticism and vast array of musical talents. First there were his forward thinking electronic productions, ‘Vacuum Boogie’, ‘Nuits Sonores’ and more, then came his debut album Elaenia in 2015 which received critical acclaim across the board in both indie, jazz and the dance music communities. But perhaps most striking are his DJ sets, which are as unpredictable as they are unique, spanning jazz, electronic, soul, world music and much more. His “You’re a Melody” nights at the late Plastic People are the stuff of legend, with the closing of the club in early 2015 becoming an iconic moment in UK dance music history. His latest production ‘Ratio’ caused quite a stir last year, and marked an astonishing return to his early house production style and proved its timelessness. This rare chance to catch the man himself all night long on a Tuesday follows one of the most credible season of events in recent memory, with Mall Grab, Jackmaster and Jasper James all having played this term. 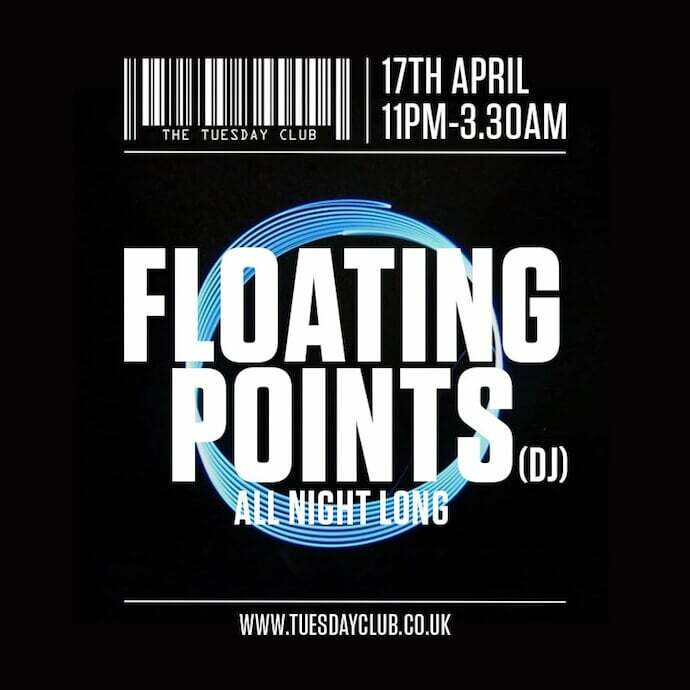 Floating Points hits the Tuesday Club all night long on April 17th. Tickets are available from £10 here.